For the serious and dedicated classic or vintage car restorer, welding is an essential skill. At some point or another, you will need to weld something on a project you're working on. When you're learning any new skill for the garage, you want to be taught by an expert who knows how to explain the simple stuff, and how to guide you through the advanced parts. When you're ready to learn welding techniques, Jerry Uttrachi is the expert teacher you want. As a past president of the American Welding Society, there is no doubt that Jerry knows his stuff. 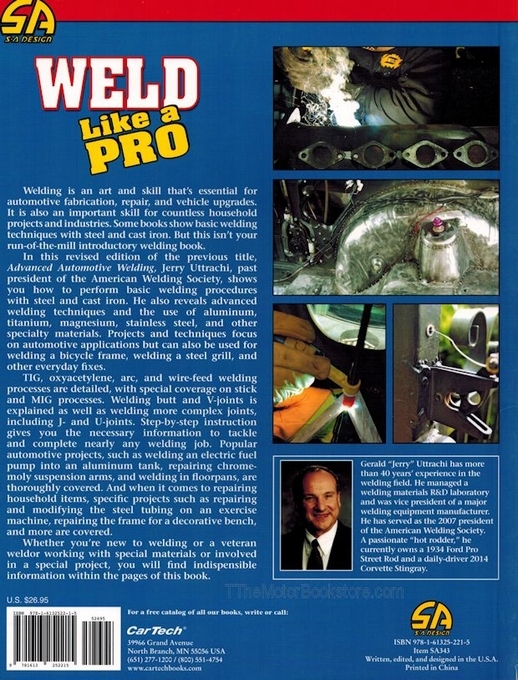 The CarTech SA343 - Weld Like A Pro book covers an introduction to welding terms and equipment, even covering the history of welding technology and explaining the science behind the different types of welds. Jerry covers all the bases of safety, and explains the American Welding Society's role in regulations and educational materials. In this revised version of his popular Advanced Automotive Welding, Jerry includes more in-depth information on basic welding procedures with steel and cast iron. He also goes into the tricks behind working with titanium, aluminum, and many other common metals. He teaches the techniques with a view towards automotive work, but many of the procedures are applicable to general household repairs, like bicycle maintenance or patching your old barbecue grill. The revised version of the book focuses on welding procedures for stick and MIG equipment, with further explorations into the practices for TIG, arc, and wire-feed welding, as well as using oxyacetylene torches. Merely covering the types of welds isn't enough. 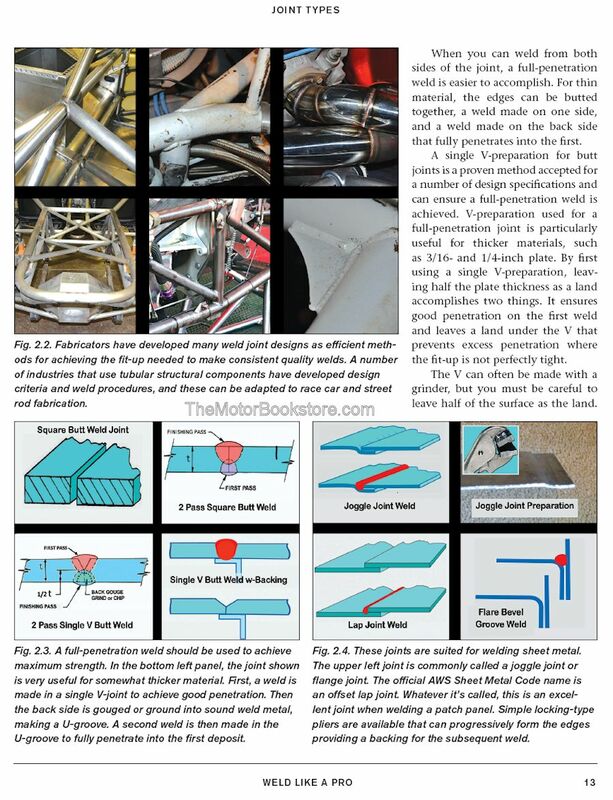 Jerry's book covers the welding procedures for several specific projects common in the garage. He demonstrates welding an electric fuel pump to an aluminum fuel tank, repairing tube frames, and seating floorpans. The book also covers projects you might encounter outside the garage, such as fixing decorative benches or repairing exercise equipment. Whether you have been welding so long you call yourself a professional welder, or you're new to the field and don't get the joke, this comprehensive guide to welding techniques will make sure you're ready to take on whatever job you face, in the garage, around the house, or in the workplace. 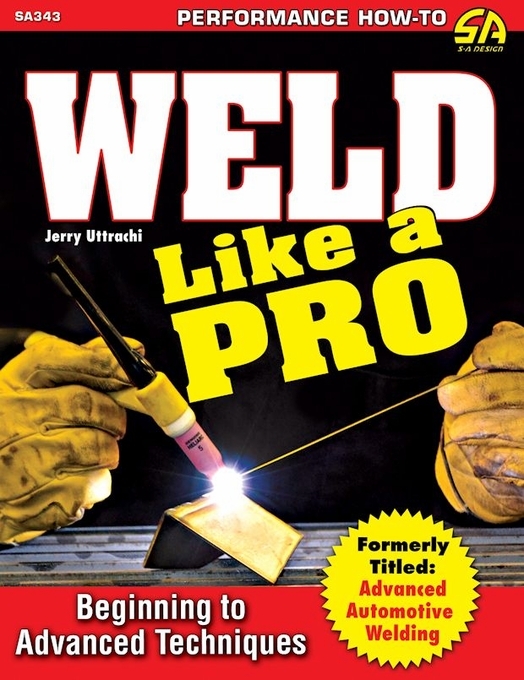 Below: Weld Like a Pro: Beginning to Advanced Techniques by Jerry Uttrachi Sample Page. Copyright CarTech Books. 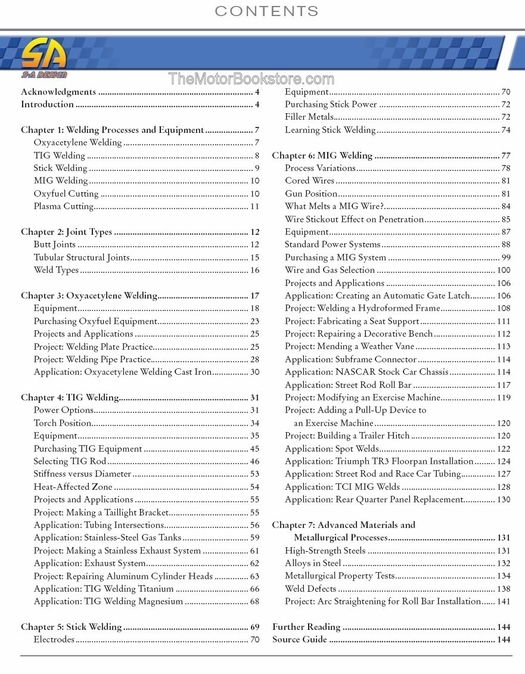 Above: Weld Like a Pro: Beginning to Advanced Techniques by Jerry Uttrachi - Table of Contents. Copyright CarTech Books. Ask a question about Weld Like A Pro.